The final day of our programme was held at Ranikhet and we arrived there the evening before. Ranikhet is at a higher altitude than Nainital but was lot different for a hill station. It looked a lot flat, more like a grassland - the difference is the tall pines and deodhars. No near by hill climbed higher than this, but at a distance we could see some awesome views of the snow peaked Himalayan ranges. The next morning, I decided to go down hill trekking. This time though, there were no other takers! One way it worked fine for me as I took an off-beaten path. Aiming for the ravine's trough, I descended quite an altitude but after somtime, I saw my futility..this was one huge hill with almost no adjoining formations in near sight! Then, I decided to a climb a small rocky formation that could give a clearer view. Once on top of it, I could realize how insignificant a creature we are.. a vast expanse of nature...snow peaks, hills, trees, birds chirping, sounds of bees..at some far distance, a winding road, some sounds of cattle, some seemed to be on the plough..as i could hear their master shouting. When I stared down the rocky precipice, my legs trembled which brought a huge realization in me..i was afraid of death. Quite similar fear happened to me in Rishikesh last year when Ganges could have easily washed me away. I had all along been debating going into a spiritual mould, but this last experience showed to me that I was too attached to my body and the work I am into! The first couple of days in Nainital I spent time analyzing the harder questions about myself as a person, Payir as a truth based organization and my own role towards that. As I got clearer and clearer about my own failings, I was much lighter and started enjoying every moment..making new and beautiful friends. With those friends, early next morning, we went trekking up the Naina hills (about 2700 m high). The locals still call this as Cheena peak as it gave a view of Chinese border villages from the top before a land slide around 1850s brought it to the present height. 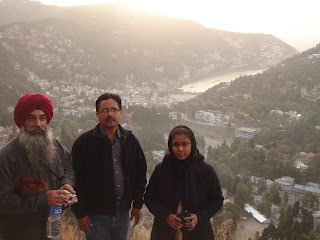 Now, it provides a breath taking view of Lake Nainital and the town. 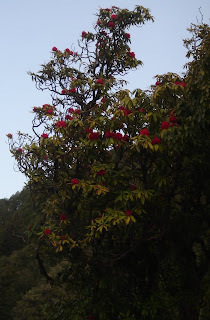 While we didn't reach the top, we still got some awesome views and could see a few Bhransh and Rhododendron in blossom. This trek made me even more lighter and for that matter during most of that day's presentations, I was laughing..more of giggling!! A few weeks before when Roopesh reminded me that we need to make Payir blog alive again, I promised to make amends from March. Around the same time, I was asked to be part of the District team to go for a Capacity building exercise on making Indian villages Open Defecation free. It was to be in Nainital and was a 5 day programme and in all it would mean being away from the village for close to 10 days with the travel. At the village though, there were many works that needed my presence. There were also lot of organizational problems - number of our initiatives going through the roughest period so far, my own personal integrity questioned over and over in the last few months. The day when I had to decide for sure on the trip, I broke down for the first time in front of public...I will write someday on that! It also helped me to decide that I needed a break! The journey to Nainital was with lot of feelings..lot of unwinding needed to happen if I needed to enjoy myself..and what a time I had! !